Pedro Pascal, Kit Harington, Sibel Kekilli, and John Bradley. Pedro Pascal, Kit Harington, Sibel Kekilli, and John Bradley posing with a پرستار in Belfast.. Wallpaper and background images in the Game of Thrones club tagged: game of thrones pedro pascal kit harington sibel kekilli john bradley. 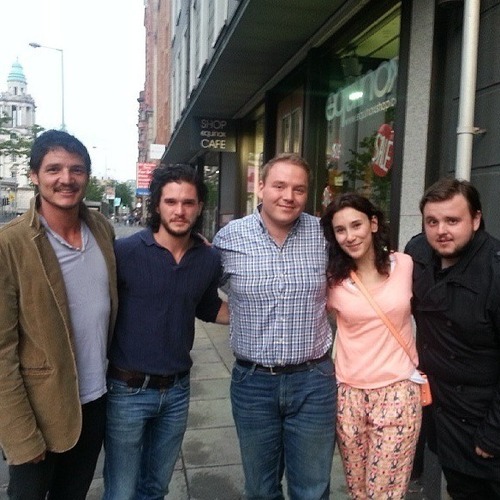 Pedro Pascal, Kit Harington, Sibel Kekilli, and John Bradley posing with a پرستار in Belfast. This Game of Thrones photo contains سٹریٹ, شہر منظر, شہری ماحول, گلی, شہر ديکھا, and شہری سیٹنگ. There might also be کاروبار ضلع, شہر کے مرکز میں, کاروباری ضلع, شہر, گاڑی گزر سڑک, and کآرریاگیوی.